Dall Sheep (Ovis dalli dalli) inhabit the mountain ranges of Alaska. These white creatures are most notable for the males’ massive curled horns. Females (known as ewes) also carry horns, but theirs are shorter and more slender, and only slightly curved. Until rams reach the age of 3 years, they tend to resemble the ewes quite a bit. After that, continued horn growth makes the males easily recognizable. Horns grow steadily during spring, summer, and early fall. In late fall or winter, horn growth slows and eventually ceases. This start-and-stop growth results in a pattern of rings called annuli which are spaced along the length of the horn, and can help determine age. Dall rams as old as 16 years have been seen, and ewes have been known to reach 19 years of age. Generally, however, a 12 year old sheep is considered quite old. Lambs are born to ewes in late May or early June. As lambing time approaches, ewes seek solitude and protection from predators in the most rugged cliffs available on their spring ranges. Lambs begin feeding on vegetation within a week after birth and are usually weaned by October. Ewes typically have their first lamb at age 3 or 4 and produce a lamb annually. The first weeks of a lamb’s life are precarious. The bulk of the mortality is in first 30 to 45 days of life, when the lambs are most vulnerable. Adult rams live in bands which seldom associate with ewe groups beyond the mating season in late November and early December. The horn clashing that rams are so well known for doesn’t result from fights over possession of ewes, but is a means of establishing order. These clashes occur throughout the year on an occasional basis, but occur more frequently just before the rut when rams are moving among the ewes and meet unfamiliar rams of similar horn size. Rams can sire offspring at 18 months of age, but normally do not breed regularly until they approach dominance rank (at full curl age and size). 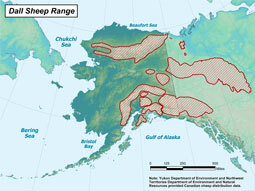 The diets of Dall sheep vary from range to range. During summer, food is abundant, and a wide variety of plants is consumed. Winter diet is much more limited and consists primarily of dry, frozen grass and sedge stems available when snow is blown off the winter ranges. Some populations use significant amounts of lichen and moss during winter. Many Dall sheep populations visit mineral licks during the spring and often travel many miles to eat the soil at these unusual geological formations. As several different bands of sheep meet at mineral licks, ram and ewe groups may mingle and young rams join the ram band which happens to be present at the time. This random contribution of young rams to different ram bands may benefit sheep by maintaining genetic diversity. Sheep are very loyal to their home ranges. Mineral licks are good spots to observe sheep because the animals are so intent on eating the dirt they pay little attention to humans. However, major disturbances such as low-flying aircraft or operating machinery readily drive sheep from the mineral licks. Dall sheep are found in the Kenai Mountains, the Tok area, the Chugach Mountains, Mentasta, Nutzotin, and northern Wrangell Mountains, and the Delta Controlled Use Area; also on the north side of the Alaska Range east of the Nenana River, west of the Delta River, and south of the Tanana River; in Tanana Hills, in the White Mountains area, and in the Central and Eastern Brooks Range. Dall sheep are found in relatively dry country and frequent a special combination of open alpine ridges, meadows, and steep slopes with extremely rugged “escape terrain” in the immediate vicinity. They use ridges, meadows, and steep slopes for feeding and resting. When danger approaches they flee to the rocks and crags to elude pursuers. They are generally high country animals but sometimes occur in Alaska in rocky gorges below timberline. Dall sheep populations in Alaska are generally considered to be healthy. Sheep numbers typically fluctuate irregularly in response to a number of environmental factors. Sheep populations tend to increase during periods of mild weather. Then, sudden population declines may occur as a result of unusually deep snow, summer drought, or other severe weather. 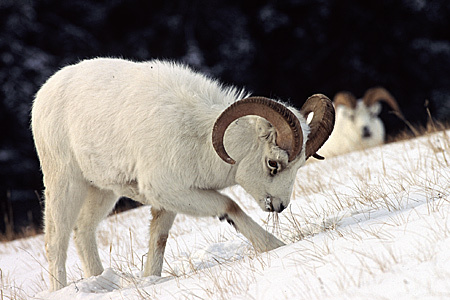 Low birth rates, predation (primarily by wolves, coyotes, and golden eagles) and a difficult environment tend to keep Dall sheep population growth rates lower than for many other big game species. However, their adaptation to the alpine environment seems to serve them well. Sheep surveys are conducted when adequate funding, appropriate weather and staff are available. Sheep are classified into the following categories: legal rams (full curl or larger); sublegal rams (less than full curl); lambs; ewes and yearling rams; and unidentified sheep. Yearling rams are difficult to distinguish from ewes and, therefore, they are summarized together. The remoteness of sheep habitat and its unsuitability for human use has protected Dall sheep from most problems in the past. However, an increasing human population and more human use of alpine areas may cause future problems for Dall sheep. Alpine areas in the subarctic mountain ranges of Alaska. Herbivorous; sheep eat grasses, sedges, lichen, moss, and other plants. Wolves, coyotes, golden eagles, wolverine, and brown bears. Ewes bear a single lamb. Dall sheep are known for their massive, curled horns and the clashes that occur among the males.